The Afghan government under President Hamid Karzai controls just 30 percent of the country, the top U.S. intelligence official said Wednesday. 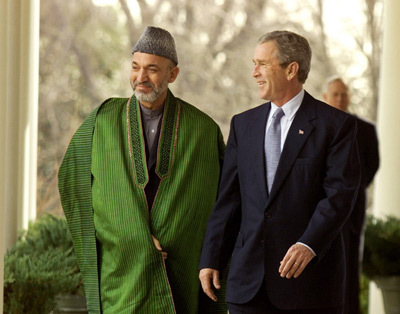 National Intelligence Director Michael McConnell told the Senate Armed Services Committee that the resurgent Taliban controls 10 percent to 11 percent of the country and Karzai’s government controls 30 percent to 31 percent. But more than six years after the U.S. invasion to oust the Taliban and establish a stable central government, the majority of Afghanistan’s population remains under local tribal control, he said. . . . Score another “Mission Accomplished” for George W. Heckuva Job, Bushie. More American soldiers will die there until we drop bombs and show we mean business (. . . or leave). Just staying there to go through the motions and make nice to extremely barbaric people accomplishes nothing. I wonder if McConnell was quoted accurately in this article. I notice it is an AP article, and anything by them is suspect & likely to be distorted. If it was an accurate quote, it just goes to show what PC Muslim appeasment over the last 6 1/2 years has brought us. If we fail in Afganistan, the damage is likely to be long-lasting, and we just don’t seem to be capable of having effective, competent leaders. People fault the US for not intervening in Afghanistan earlier. But what kept Afghanistan from becoming an al Qaeda safe haven was the civil war until 1996. By 1998, when the Taliban had control of 90% of Afghanistan, THAT was when it started becoming an al Qaeda safe haven. Like in Iraq, the best thing that the US can do is leave, AFTER ensuring that all the warring factions – Pashtoon, Tajik, Hazara et al are fully armed, and also making sure that in future, no single group gains a monopoly on power the way the Taliban did. If that can’t be done, plan B: nuke the place. I suppose the current status of Afghanistan is a function of taking our eye off the ball there. Yes, we can certainly fight two wars at once, but we must be committed and that requires killing people, breaking things and letting Allah sort them out. I like Infidel Prides plan B. Like right now. Pull our guys out then nuke till crispy and flakey on the outside. Barbarians cannot be governed; their barbarous way of life can be controlled to a degree only through equal forms of barbarous brutality and brute force.